Book Review: What's Your Purple Goldfish — Toister Performance Solutions, Inc. I always enjoy a book that’s practical. One book that fits this description is What’s Your Purple Goldfish? 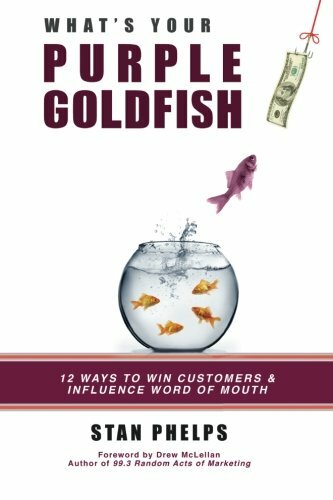 : How to Win Customers and Influence Word of Mouth, by Stan Phelps. Phelps defines a purple goldfish as an “unexpected surprise that’s thrown in for good measure to achieve product differentiation, drive retention, and promote word of mouth.” He argues that companies pursuing a purple goldfish strategy stand out from a sea of sameness by creating memorable experiences that customers will talk about. The book is full of real stories and examples that illustrate each specific concept. In the spirit of practical application, I thought I’d contribute one of my own. My wife, Sally, and I recently traveled with friends to Paso Robles, California to do some wine tasting. We made a point to visit one of our favorite wineries, Herman Story. Herman Story initially won us over with their outstanding wine. A purple goldfish has made us loyal fans. Winemaker Russell P. From likes to chat with visitors in the tasting room. Whenever we’ve been there, From has offered us a chance to taste some additional wine that wasn’t on the tasting menu. On our last trip, From poured us several wines that hadn’t even been bottled yet. He had poured them straight from the barrel just to give his guests some extra enjoyment. It’s fun to learn about wine directly from the winemaker. It’s even more fun to taste something that hasn’t even been released yet! Tasting a barrel sample at Herman Story. What’s Your Purple Goldfish? is a fast and enjoyable read. I highly recommended it if you’re looking for ideas and inspiration for standing out in your customers’ minds. You can purchase the book on Amazon or view this preview slide show to learn more about it.